A fortunate punter located in the European Union was able to have an incredible start to their week as they triggered an incredibly large progressive jackpot while playing at Paddy Power. This punter was spinning the reels on Adventures In Wonderland when she triggered a progressive worth £564,665. Though this doesn’t break the one million euro mark it is still a large enough amount of money that your life can forever be changed from the jackpot win. Ash Gaming, the software developer behind Adventures in Wonderland has created multiple progressive slots throughout their years of operation and each one has seen multiple life changing wins. Adventures in Wonderland is by far the most popular of their progressive jackpot slots as the progressive on this slot has been won three times this year alone. The largest progressive win recorded for this slot is £642,992 which was won earlier on this year in August. At this time there isn’t any other information informing us as to who won this progressive or what this winning player will do with the mass riches that they’ve just earned. Those wishing to try their luck on this slot easily can do so by signing up with Paddy Power today or you can visit gaming information sites such as Casinos2Win.com to get up-to-date information on new slots and progressive jackpots. Luckily for our viewers we will be ensured to inform our viewers of any updates on this news story. Congratulations are in order for this winning punter. Microgaming have revealed their latest slot machine to online punters. This new slot machine is called “Max Damage”. It takes players deep into space where you get a lovely view of Earth. You fight alongside various soldiers in order to take the space station and get a hefty pay check in the process. This slot is being released on November 5th, 2014. Max Damage has been designed as a 5 reel, 243 Payline video slot that is designed around the character Max Damage from Microgaming’s previous video slot “Max Damage and the Alien Attack”. The Aliens have taken over the space station and it’s your job to make sure that they don’t take over Planetary Defences. Along the way you will notice that you can trigger free spins, wilds, scatters, win multipliers and a bonus round. This’ll allow for punters to have that much better of an opportunity at triggering the maximum jackpot in this slot. There is no word as to which online casino has the rights to first offer Max Damage. Those who wish to play this slot will be either required to sign up a player account with that casino or they’ll have to wait until this slot becomes available at their Microgaming powered online casino. We shall inform you on any information released regarding which casino will first be offering this video slot. It’ll provide an unprecedented experience that is sure to impress every punter who has played under the Microgaming platform before. In an industry filled with developers creating new slots every month it’s nice to see a unique experience developed. Yggdrasil Gaming, an upcoming developer in the industry has continually released unique video slots throughout 2013 and 2014. Their latest slot Pyrons continues their unique approach to developing slots. Pyrons is unique in a way that instead of the reels spinning and stopping at a certain moment, the reels have symbols fall into a random position. It’s a new take that changes up the way the game is played. As of right now we only know of two game features that will be available within this slot. The first is exploding wilds, random symbols on the reels once you land on the exploding wilds will explode and be replaced by new falling symbols. There is also a multiplier in Pyrons that ranges from 2x, 3x, 5x to 20x your winning combination. Pyrons is currently available at any online casino that offers the Yggdrasil Gaming platform. Once you first load this slot the unique design, gameplay, symbols, reels and background will make you feel immersed into a wonderful experience. Anyone can play this slot, all that is required of you is to find an online casino which provides the Yggdrasil Gaming Platform and then register an account with that casino. Afterwards a simple deposit and searching of “Pyrons” will allow for you to play this new slot. We will inform you of any new game features of elements revealed about this slot in the future. Regardless you can expect great things out of Yggdrasil Gaming’s new slot “Pyrons”. Pinnacle, an online sports betting firm just announced hours ago that they will be leaving the United Kingdom online gambling market come the end of September. Pinnacle is one amongst many that are leaving the UK Gambling Market due to new tax and licensing regulations being put into effect by the UK Government at the end of September. Pinnacle Sports made this announcement through an email that was sent out to all affiliates and customers in the UK. The email noted that punters will have until 11:59 P.M BST on September 30th to withdraw any funds that they still might have at the casino. After this deadline punters will no longer be able to access Pinnacle Sports for their gambling services. They are considered to be one of the best online sports betting sites available in the UK. You could wager on anything from Soccer to Basketball to Formula 1. Their player base is massive and you can be ensured that those players will miss their experiences with this sports hall. You can still access their gambling services until September 30th which isn’t for another fourteen days. You can have two more weeks of some of the best sports betting experiences known to the British. Pinnacle also offered punters live casino games, slots, table games and mobile casino games as well. They were a force not to be reckoned with but with Pinnacle leaving the market this leaves a void in the market that needs to be filled, it’s only a matter of time till another casino such as Pinnacle begins operations in the UK. An ideal place to visit for all your latest in gambling related information is www.casinos2win.com. Have you ever wondered what it would be like to find a chest filled with gold? Well in Chests of Plenty there is a very good chance that you will come across a chest filled with gold in it, this gold transferring over into real money. One punter playing at Sky Vegas was able to access one of these golden chests and win £340,267 on this Ash Gaming developed video slot. Chests of Play for those of who you don’t know is a 5 reel, 20 payline video slot that’s been developed by Ash Gaming. While playing this slot you see an oasis filled with palm trees, a beautiful beach and a large pirate ship in the background. Reel wise you notice poker symbols designed around the theme, parrots, swords, the captain, a map and plenty more as slot symbols. This truly places you into a brand new world where you must fend off your winnings from pirates who wish to steal it. Game feature wise you have scatters, free spins, wilds and a progressive jackpot up for grabs. This gives players plenty of opportunities to win large quantities of money. No details have been released regarding who won this progressive or what they plan to do with their wins. The reason for this is because this jackpot was taken less than twenty four hours ago. We will inform you on any updates released regarding this jackpot’s winner and what they will do their mass amount of winnings. There are hundreds of online casinos operating within the online gambling market but only a select few of these online casinos have been able to grow popular throughout the years. Sky Vegas is one of those online casinos, three or four times a month you will hear about how a massive progressive jackpot has been triggered at this online casino. This month proves no different as just last weekend a lucky player spinning the reels on “Rumble in the Jungle” was able to win a progressive worth £165,080. Rumble in the Jungle is an OpenBet designed video slot that consists of five reels and twenty paylines. Designed around a jungle theme you see various symbols that would represent an adventure in the jungle. Thos symbols include tropical birds, bamboo poker symbols, wild flowers and more. The background which is centered around the reels consists of the jungle itself. You see two large trees, foliage and wild flowers roaming the background. This in return makes the theme believable and exciting for all who play this slot. This win is still considered to be fresh which is why Sky Vegas has yet to release any comments that the winning punter might have said. It does take time for punters to receive their funds and make a comment, once those comments are made you will be informed of them. This is the second time that a progressive has been won through this slot, the first time it was won the lucky player was able to win £403,680. Canada is one of the better countries known as a beautiful country that spans multiple different types of landscapes. You can enjoy the plains of Manitoba, the rocky water adventures of Nova Scotia, the hustle and bustle of Ontario or you can enjoy the mountain landscapes of British Columbia. Whatever it might be you fancy, Canada has it for you to enjoy. Though with all that nature around you might want for something a little different and one of those was an IT Professional from Canada, who decided to spend some time playing at Slotland. 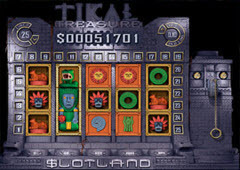 This resulted in him winning $169,072 on Tikal Treasure. Every slot you play at Slotland is tied into the casinos progressive jackpot. This allows for the jackpot to be won on a regular basis and provide more punters with life changing wins, you could be the next big winner by registering an account with Slotland and playing one of their many video slots. Microgaming is one of the most impressive developers to ever grace the online gambling industry. They have more than two decades of experience and continue to push out some of the best games online today. On a regular basis you will read stories about large wins from players around the world and this is testament that Microgaming continues to remain popular, not just for its game selection but for its game quality. The progressives offered by this company is one of those reasons and with some many people playing those slots, it sees many of their jackpots become record breaking, or at the least, news worthy. Three days ago a fortunate gambler spinning the reels on Microgaming’s Major Millions was able to win a progressive jackpot worth the total amount of $896,978. This isn’t the largest progressive to be won through Major Millions but is none the less a life changing jackpot win. The largest progressive to be won through this video slot is $1,801,517 and that was won back on May 5th, 2012. Normally this jackpot is won every three to four weeks, this time the Major Millions jackpot went twenty weeks within being won. This allowed for the jackpot to grow to incredible heights, thus by allowing for this punter to win this large sum of money. You have the opportunity to be one of the next Major Millions winners, you have to first create a player account at any casino that offers this slot and then deposit your money into your account. Then you can experience this slot and play to win the big money. Gamesys, a long lasting software developer in the online gambling market announce that they have had to abandon their social gambling platform on Facebook. This means that the Slots Frenzy and Bingo apps that Gamesys created for their social media website have been pulled and are no longer available to the general public. This announcement came after Gamesys received a large amount of complaints relating towards these applications, that is when Gamesys announced that they have already pulled down the applications. The applications have been available to players for the last two years, when Gamesys didn’t give anyone notice that they were pulling down these social media betting platforms players reacted in a harsh manner. Those players took it upon themselves to call Gamesys representatives, email and post complaints all over their Facebook page. The Gamesys platform is still being operated on JackpotJoy and anyone who enjoyed the Gamesys platform can still experience it by registering an account with JackpotJoy. The only difference will be that you’ll be playing with real money and you’ll be winning real money, it’s just the next step in your online gambling adventure. Delaware is one of the three states within the United States of America to have a legalized online gambling market. Unfortunately out of Delaware, Nevada and New Jersey it is Delaware that turns the lowest profits on a monthly basis. Last month Delaware was able to see a slight growth in revenue just as they did during March, this in return has showed Delaware officials that their online gambling market still have the opportunity to be profitable. There is currently only three online casinos that are licensed and regulated within Delaware. These three online casinos include Delaware Park, Dover Downs and Harrington Raceway. All together these casinos were able to bring in $240,496.08. Delaware Park brought in $180,900.38 while Dover Downs brought in $48,553.07. Harrington Raceway on the other hand wasn’t able to earn remotely that much, bringing in only $11,042.48. Regardless if this isn’t a large amount of money or not, it is still an increase when compared to March. During March, Delaware only brought in a total of $206,833.48 in revenue. Unfortunately, online poker in Delaware dropped in revenues this month and only $74,078.44 in revenue was generated. It should be noted that while Delaware’s online gambling market might be small in revenue, the state’s population only consists of one million people and this plays a large part in overall revenue.